After the eats, folks gathered on the patio at Castle Manor for a group photo. The photo below was taken by Spider Draves' daughter. Dan Nicolini had worked at arranging folks and was leading everyone in the MHS fight song; that's the explanation for some of the facial expressions. Click on that image, and you'll get to a larger size of the same image that you're welcome to save, courtesy of Spider's daughter. Below are sections of the photo, enlarged, and with identifications, section by section, beginning from the left side of the photo. Steve Cunningham is in front, seated. Keith Albright is on the left side in a dark baseball cap. Jim Thomas is next to Keith (in striped shirt and tan cap). Next to Jim is Neil Brioli in a baseball cap at the back. Directly behind Cunningham is Steve Van Ooteghem (in a dark shirt). Next to Van Ooteghem is Randy Marks, in a white and blue polo shirt. Next to Marks is Bob Lese. Between Marks and Lese is Mike Natali. Behind Natali you can see the top of Mike Unruh's white baseball cap. Seated in front are Marsha Honold (left) and Paula Lampert (right). Standing behind them, from left, are Bob Lese, Paula Miller, and Connie Gilvin. Behind that row you see the barest part of Mike Natali's face on the far left, then Rick Paridaen, then Steve Saros (in salmon-colored shirt), then Terry DeMaegd, then Bob Mead on the far right just behind DeMaegd. In the back row are three men, two with faces hidden: First is Ray Wennerstrom in a black baseball cap with some lettering and with his face entirely hidden. Next is Marc McCray in a drab-colored baseball cap with his face mainly hidden by Saros. And next is Andy Palatinus. Seated, left to right are Becky McCoy, Mary Ann Pechi, and Carolyn Schwartz. 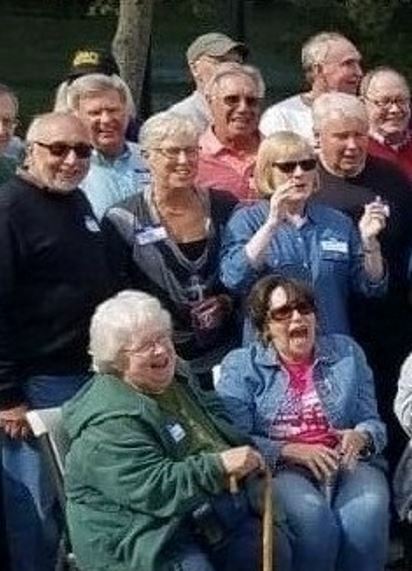 Directly behind McCoy is Cheryl Bobson; next to Bobson is Cindy Hoffman; next to Hoffman is Jane Zimmerman; next to Zimmerman is Alan Stafford. Directly behind Bobson is Phil Stillson. (On the left, next to Stillson, is Bob Mead, which shows continuation of photo.) Back row, left to right, beginning directly behind Stillson: Jerry Cavanah, Bill Groth, Tammy Reed, Pat McGee. Seated on the ground is Patti Mills. Next to Mills is Lori Eiswald, mostly hidden by Dan Nicolini's arm. Seated behind Patti in chairs are (left to right) Carolyn Schwartz, Jimita Baldoni, Debbie Morse, and Debbie Koepke. 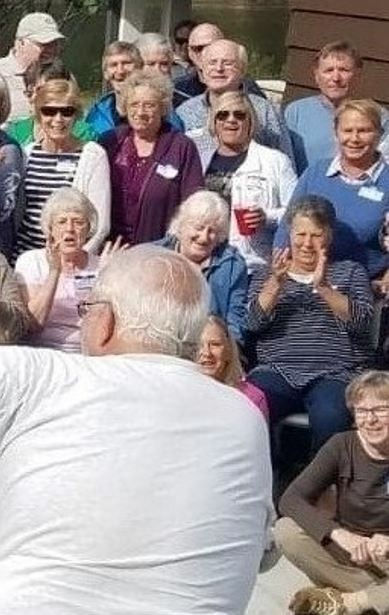 Standing behind them (left to right) are Cindy Waidner in a blue denim jacket, Eve Thompson, Peggy Sinkovics, Carole Signorino (in red shirt), Mary Rhoade, and Susan Hess (in sun glasses and striped shirt). 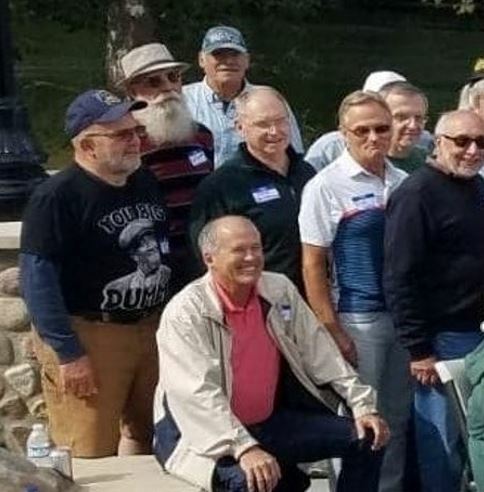 In the back are Pat McGee and Alan Stafford, then Jim Locke, Roger Brady, Randy Smith (in dark baseball cap), and Tom Hummer in a gray cap with his face partly hidden. Directly behind Hess is Jean Craft (green shirt, face mostly hidden). 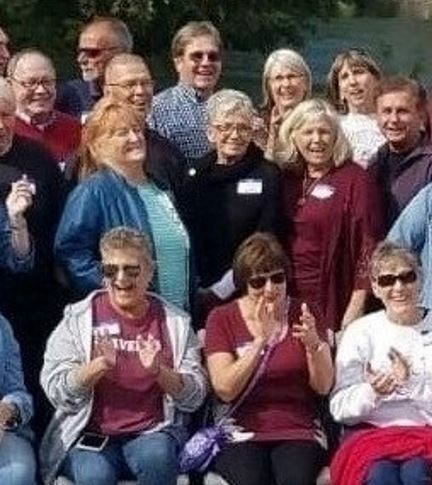 Directly behind Rhoade is the blonde hair of Janet Skiles, with her face entirely hidden. Seated in the front on the ground is Margaret Hutchison. Next to her (to left in photo) is Pam Craig in a pink top. That's the back of Dan Nicolin's head. Seated in chairs (left to right) are Debbie Koepke, Dawn Housand, and Linda DeMeulenaere. Standing behind them (left to right) are Susan Hess, Sharon Gill, Connie Shaffer, and Toby Roose. Directly behind Hess is Jean Craft, in green, with face hidden. In the back, the line zig-zags. On the far left is Tom Hummer (tan cap, face hidden). Then Tom Grau. Then Larry Karnes (face partly hidden). Then Kerry Deardorff (far back, face partly hidden). Then Mark Hildebrand in front of Deardorff. Then Gary Derbin in a light-blue shirt/sweater. Seated on the ground in front is Margaret Hutchison. Seated in a chair behind her is Linda DeMeulenaere. Toby Roose (in a light-blue sweater) is behind DeMeulenaere. Becky Smith is in the center of the image, in a denim jacket. 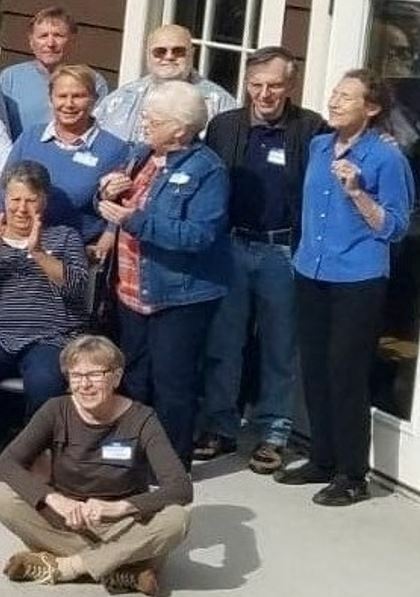 At the back, far left is Gary Derbin in a light-blue shirt/sweater; then Spider Draves; then Cosimo Natali with his arm around Diana Roberts (in blue shirt and dark pants). 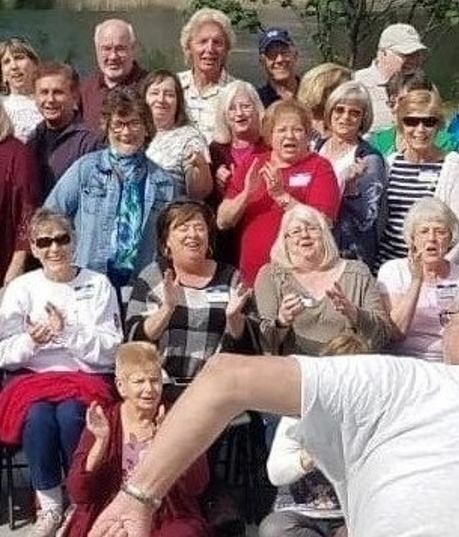 Some folks who were at the reunion are not in this photo. (2) Text file w/ contact info for most from MHS '68; email Alice to request it.